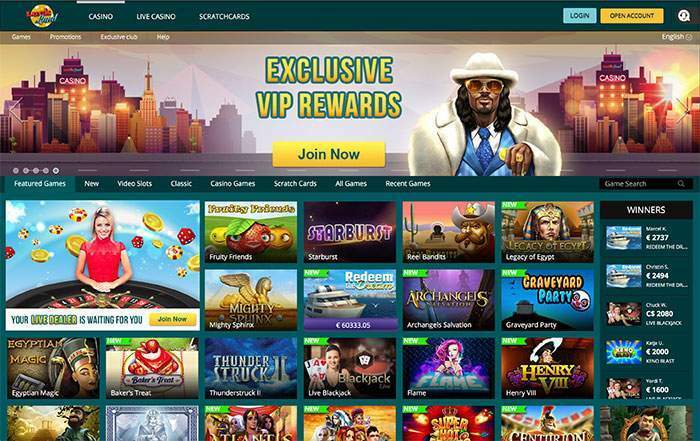 LuckLand Casino is an online casino with a wide selection of NetEnt and Betsoft slots and casino games. All games are easy and fast to play via an instant play interface and no download is required. The site also offers good live chat support and is available in English, Spanish, and French. Luckland has a nice selection of bonuses where we can highlight the welcome bonus. To make maximum use of this bonus, you make three deposits. In total this comes to a nice welcome bonus of 1000 Euro to start with! Also check out the reload bonuses and the extensive VIP program. LuckLand Casino has a large collection of NetEnt and Betsoft games. These include dozens of high-quality bonus video slots, including a number of 3D slot games. Some of the most popular titles are Starburst, The Tipsy Tourist, Twin Spider, Gonzo’s Quest and Fruit Shop. The only games that are actually missing are the progressive jackpot games. Table players also have a good variety of games to choose from at LuckLand Casino. The site offers 9 Roulette games, 11 Blackjack games and many other table games such as Poker 3 Heads Up Holdem, Pai Gow Poker, Oasis Poker, Three Card Rummy, Red Dog and Baccarat. Video poker enthusiasts can enjoy a number of different variants, ranging from traditional to modern. Some of the most popular include Bonus Deuces, Jacks or Better, Deuces and Joker, Joker Poker and Bonus Poker. Players looking for something different can also go for Virtual Racebook 3D and Keno. Players at LuckLand Casino are also well catered for along the way. The mobile version of the casino works perfectly on most modern smartphones and tablets including iPhones, iPads and Android phones. LuckLand Casino has a support department that is always there for you. Players can quickly connect via a live chat on the website. Employees of LuckLand Casino can also be reached via the free phone number in different countries. E-mail support is also available. LuckLand Casino ensures that the players are well protected by the use of SSL encryption. This technology makes it virtually impossible for malicious parties to read sensitive data from players, such as passwords, financial data and other references. All games at LuckLand Casino are offered by trusted suppliers. They have all been regularly checked by independent bodies such as GLI, which verify that every game generates random results. Payment Methods: EcoPayz, MasterCard, Neteller, Visa, Skrill, Bitcoin. Withdrawal Methods: Bank Wire Transfer, Neteller, Skrill. Afghanistan, Aland Islands, Algeria, Angola, Anguilla, Anonymous Proxy, Aruba, Belgium, Benin, Bolivia, Bouvet Island, Cambodia, Central African Republic, Chad, China, Colombia, Congo – Brazzaville, Congo – Kinshasa, Costa Rica, Cyprus, Czech Republic, Denmark, Djibouti, Dominica, Dominican Republic, East Timor, Estonia, Ethiopia, France, French Guiana, French Polynesia, French Southern Territories, Gabon, Gambia, Ghana, Grenada, Guadeloupe, Guam, Hungary, India, Iran, Iraq, Israel, Italy, Jordan, Kenya, Kyrgyzstan, Laos, Madagascar, Malawi, Malaysia, Malta, Martinique, Mauritania, Mauritius, Montenegro, Morocco, Mozambique, Namibia, Niger, Nigeria, Pakistan, Palestinian Territories, Paraguay, Philippines, Poland, Portugal, Puerto Rico, Romania, Rwanda, Réunion, Senegal, Sierra Leone, Somalia, Gaza Strip, Spain, Sri Lanka, Sudan, Swaziland, Syria, Tanzania, Thailand, Togo, Tunisia, Turkey, Uganda, United Kingdom, United States, Wallis and Futuna, Yemen, Zimbabwe.